12.6.2017 To answer power with power, the Jedi way, this is not. Obi-wan Kenobi: He’s taken only a small ship, and his padawan. Master Yoda: Twice the trouble, they have become. A wreckless decision, Skywalker has made. Senator Palpatine: Let us hope it is not a costly one. 10.6.2017 Twice the trouble, they have become. Master Yoda: Tragic are these losses, but prevent more,we must. 10.6.2017 Tragic are these losses, but prevent more,we must. Master Yoda: In the end, cowards are those who follow the dark side. 10.6.2017 Cowards are those who follow the dark side. Master Yoda: Greet them I will. Lieutenant Thire: General, you don’t plan to take that whole column by yourself? Master Yoda: Have you three I do. Outnumbered are they. 10.6.2017 Have you three I do. Outnumbered are they. Master Yoda: Rys, always focuse on the enemy, are you. For inspiration, look to yourself, and those beside you. Jek, concerned about weapons you are. Weapons do not win battles. Your mind, powerful it is. Outthink the droids, you can. Thire, rush not into fights, long is the war, only by surviving it, will you prevail. Clones you may be, but the force resides in all life forms. Use it you can, to quiet your mind. 10.6.2017 Clones you may be, but the force resides in all life forms. 10.6.2017 In the force, very different each one of you are. Lieutenant Thire: Those tanks are too big to follow. 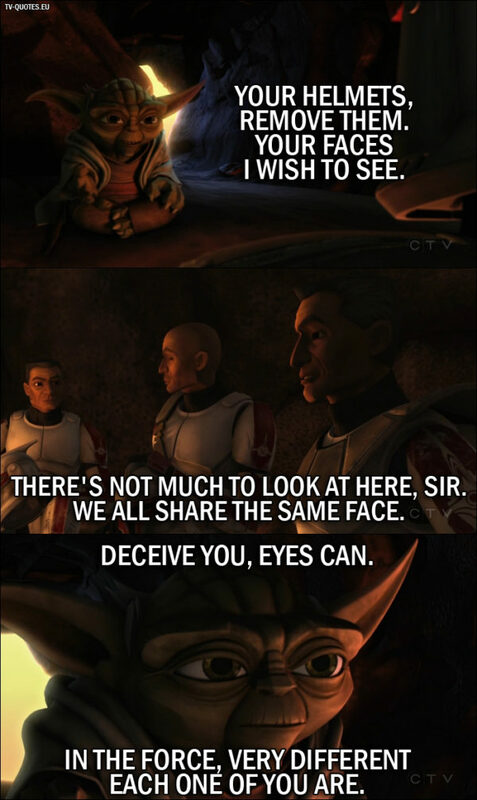 Master Yoda: See, see? Size is not everything. Smaller in number are we, but larger in mind. Jek: Do you have any idea what the general was talkin’ about? Rys: How should I know? There’s no figurin’ a Jedi Master. 10.6.2017 Smaller in number are we, but larger in mind. Lieutenant Thire: Sir, the rendezvous point is that way. Master Yoda: As is our enemy. To reach our goal, a straight path we will not follow. 10.6.2017 To reach our goal, a straight path we will not follow. Obi-Wan Kenobi: Let’s just hope Anakin is ready for this responsibility. Master Yoda: Ready, he is, to teach an apprentice. To let go of his pupil, a greater challenge it will be. Master this, Skywalker must. 30.5.2017 To let go of his pupil, a greater challenge it will be.